In a new interview, Nicolas Cage reveals that David S. Goyer's original script for Ghost Rider was R-rated and that the movie was intended to be much darker than it ended up. Johnny Blaze's story was in development hell for years before the movie finally made it to theaters in February of 2007 with a PG-13 rating. Many people, cast and crew, were attached and later left, which led to script rewrites and a less than stellar reaction when the movie finally hit theaters. Nicolas Cage hopes that the Ghost Rider movie will get remade with another actor and also hopes that the studio takes it in a Deadpool direction in terms of rating. Apparently, the studio wouldn't allow Cage and David S. Goyer to make the movie that they envisioned back in 2006. The actor goes as far as to call Goyer's script "brilliant." He had this to say. "Y'know, Ghost Rider was a movie that always should've been an R-rated movie. David Goyer had a brilliant script, which I wanted to do with David and for whatever reason they just didn't let us make the movie. But that movie is still a movie that should be made, not with me obviously, but it should be an R-rated movie-heck, Deadpool was R-rated and that did great. GHOST RIDER was designed to be a scary superhero with an R-rating and edge and they just didn't have it worked out back then." 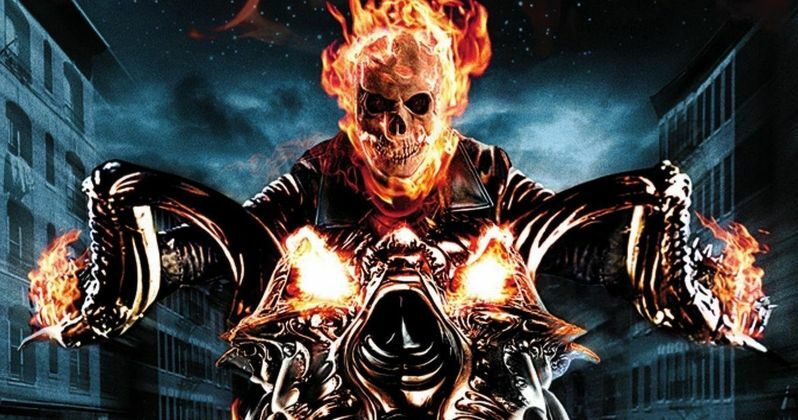 While the script ended up being Frankensteined together, Nicolas Cage's portrayal of Johnny Blaze in the Ghost Rider was also much different than what comic book fans envisioned. Blaze is a hard partying, hard living character that Cage took down a notch. He wanted to bring another layer to Blaze to make him seem deeper than he normally is in the comics. Fans were taken aback, but the Ghost Rider movie was still a hit at the box office and ended up with a sequel. There's been a lot of talk about the R-rating of comic book films lately with the success of Logan and Deadpool. The Ghost Rider movie could use a reboot with a story that closely resembles that of the comics in terms of a grittier tone. Whether that happens is anybody's guess at the moment, but it could happen at some point in the future. The Ghost Rider movies from over a decade ago weren't well received when they came out and they have not aged very well at all. Ghost Rider could possibly end up as a series like The Punisher on Netflix, which would be welcomed by Marvel fans. However, that's just speculation at this point in time. A version of the character was introduced on Agents of S.H.I.E.L.D., which has landed okay with the fanbase. One thing is for sure, Nicolas Cage backs a new gritty reboot with a new cast, and that should say something. Hopefully somebody takes up the challenge to bring a faithful to the source material version of Ghost Rider soon. The interview with Nicolas Cage was first published by JoBlo.